Most products can be found with cheaper price at EarthHero.com, Vitacost and LuckyVitamin.com, especially during Black Friday sale. Subscribe to their newsletters to get deals such as 20% off site wide, or instead of subscribing with your email address, view their newsletters at Groota app and keep your inbox clean. I use them to replace ziplock. They are more sturdy than ziplock. You can completely wash them inside out, and therefore they are reusable. In my case each bag can be reused for a few months. 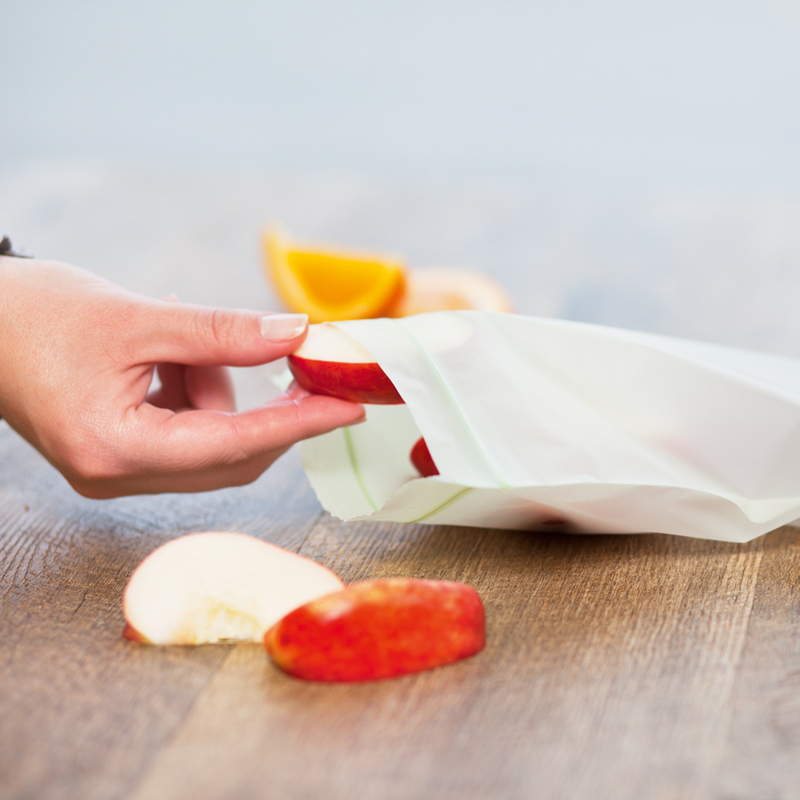 BioBag has many compostable products, and hands down sandwich bags are my favorite. My favorite place to buy: EarthHero.com. Price is a bit cheaper than Amazon, but it’s tax-free to buy from them online and ship to my state. Subscribe to their newsletter to get occasional free shipping on all orders. There are tons of other ethical products you can buy from EarthHero, and they make shopping easier by putting certificate icons on product page. In my area I can recycle aluminum foil with food stains. With this 100% recycled aluminum foil, I can form a wonderful recycle-cycle 😉 I love their parchment paper too. Chlorine-free, FSC certified mix paper, and a great price (70 sq ft for 5 to 6 dollars at some websites). I have BioBag for packed lunches, so why do I need waxed food wrap? Truth be told, I usually wash dishes once a week. It means I will sometimes run out clean covers to cover leftovers. I used to fall back to plastic wrap, and now I use waxed wrap. I also use them to wrap meat and fish to store in the freezer (I suggest that separating the wraps for meat and general use). You can find many waxed food wrap in the market, but Trader Joe’s Waxed Cotton Food Wrap is the best price I can find. Availability based on locations. If your local Trader Joe’s don’t carry it, you can try Bee’s Wrap, Abeego, or DIY at home. I’ve hosted several big BBQ parties where my own silverwares and mugs are not enough for everyone. Before I found Eco Products I have no choice but use plastic utensils and cups. 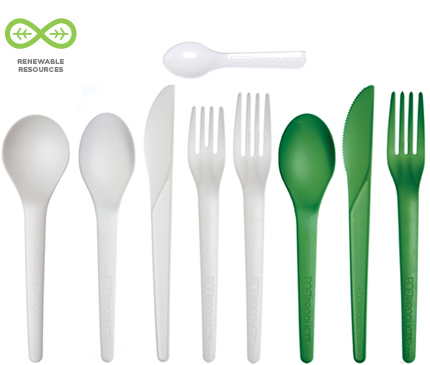 Eco Products’ Plantware utensils and GreenStripe Cups are BPI certified compostable. I’ve seen these products in local restaurants, so you can rest sure that they have good heat tolerance and they are durable. Bonus point: they can be reused many times. My favorite place to buy: their online store at https://www.ecoproductsstore.com. It seems that you can only get these products from wholesales, so I just place orders on their site and pay the shipping. Like Eco Products’ cutlery, they are durable with great heat tolerance. This is a good choice if you don’t want to buy big quantities. Some online stores such as Amazon can ship free with Prime. If you are looking for cute looking utensils for the party, try susty party products. The only place to shop susty is Amazon. What’s more to say? Safe and cute toys with 100% recycled materials. My favorite place to buy: Amazon, not the best price but it sells most of the varieties. If you have specific toy in mind, google the product name and you might find better price at Newegg, Overstocks.com or local Target. Ok, these shoes are pricy, but not only they are made with 100% recycled water bottles, their shoes are insta-worthy and washable. And they are super durable. 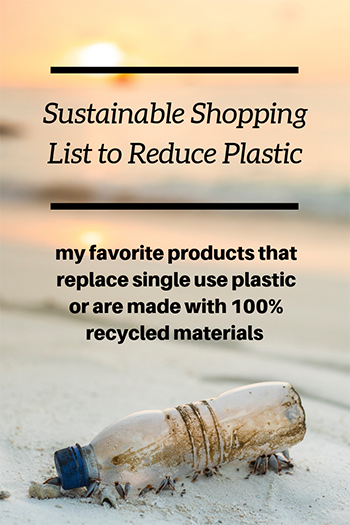 Toothbrushes, tablewares, and most plastic products they sell are made with 100% recycled plastics. Bonus point: a lot of them are recycled #5 plastics. If you have been recycling plastics, you would know very few waste management company take recycle #5. The rugs are made of plastic, so there are many obvious benefits out front: suitable for indoors and outdoors, mold and mildew resistant, and kids can sit on it and eat and get messy. Options of modern styles and colors are plenty, like this one, and 6′ x 9′ for $115 is a good price for a rug. Shipping cost depends on the location. To ship to my state it costs extra $20. More consumers are aware of the threats that plastic brought to our environment, and products with labels of “compostable” and “biodegradable” are getting popular. To make things less confusing, BPI, a non-profit organization, issues certifications based on ASTM test methods and specifications, similar to European specifications being used. In short, if you see BPI certified compostable, that means the products are compostable in industrial facilities. Most landfills in USA is air-tight and nothing decompose, not even compostable products. Lucky for us, in many urban areas in USA, such as Seattle, you can put compostable products in curbside trash bins (In Seattle, the trash bin is marked with ‘compost’, the one you put food and yard waste). For more information on landfills, read this article from BPI, and to figure out if you have industrial facilities to handle compostable products, ask your local waste management company or search your zip code here. In most cases, if your local waste management company takes food waste and yard waste to compost site, you can put compostable products in that bin.